The AES Milan Convention, taking place 23–26 May at the NH Hotel Milano Congress Centre in Milan, Italy, will offer more ways to listen, learn and connect than ever before with its schedule of Student and Career development events. With significant savings on student All Access registration, attendees can affordably enjoy four full days of educational and career advancement events, a technical program featuring a host of presentations on a variety of audio engineering disciplines, special events such as the opening ceremonies and keynote speaker, and exhibition floor showcases and events from leading audio companies from around the world. Additional student activities include recording critiques, an Education and Career Fair, and newly expanded student design and recording competitions. The official opening of the Convention’s student program, and a great opportunity to meet with fellow students from all corners of the world, is the opening SDA meeting. This event will introduce new events and election proceedings, announce candidates for the coming year’s election for the Europe and International Regions Vice Chair, announce the finalists in the Student Recording Competition categories and the Student Design Competition, and review the schedule of all student- and education-related events taking place at the convention. A closing SDA meeting will be held on the final day of the show, where the SDA will elect a new vice chair, and where competition comments and awards will be presented. 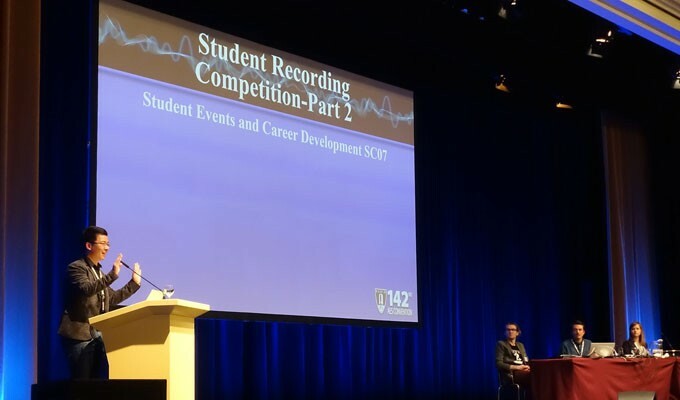 The Student Recording Competition is a highlight at each AES convention, hosting a distinguished panel of judges to participate in critiquing finalists of each recording category in an interactive presentation and discussion. The top three finalists in each category present a short summary of their production intentions and the key recording and mix techniques used to realize their goals before playing their projects for attendees. This year, a new Remix category has been added, allowing competitors ample space and freedom to create what they feel best expresses, or enhances, the music from a provided track. The competition is a great chance for students to hear the work of their peers at other educational institutions and to network with other students and faculty. The Saul Walker AES Student Design Competition is an opportunity for aspiring hardware and software engineers to participate in a worldwide contest during AES Conventions and gain recognition for their hard work, technical creativity, and ingenuity, as well as advice and mentorship from the competition judges. The competition is named in recognition of Mr. Walker’s tremendous impact on the audio industry as an inventor and as an educator. Awards will be presented for product designs including loudspeakers, DSP plug-ins, analog hardware, signal analysis tools, mobile applications, sound synthesis devices, and more. Additionally, the AES will be announcing further details of a newly established AES MATLAB Plugin Student Competition and Showcase, in which students will design and present a new audio production VST plugin using MATLAB software. 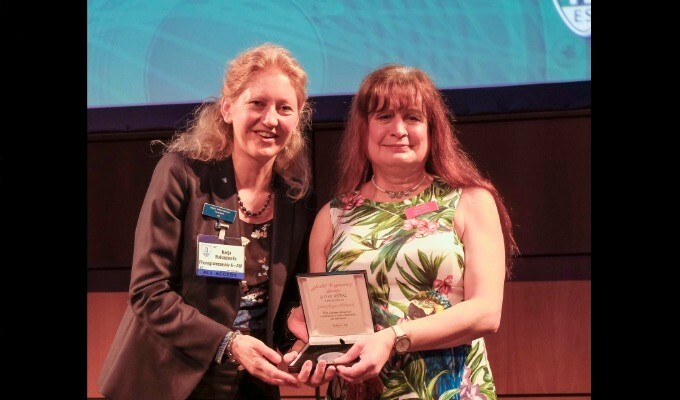 A special tutorial will be held at AES Milan, and later to be released as video, on the topic of MATLAB and outlining the competition’s rules and inaugural awards, to be given at the 145th AES International Convention in New York City in October 2018. The combined AES 144th Education and Career Fair will match job seekers with companies and prospective students with schools. Academic Institutions offering studies in audio (from short courses to graduate degrees) will be represented in a “table-top” session. Information on each school’s respective programs will be made available through displays and academic guidance. For those already searching for their entry or next path into audio engineering, AES Milan will host top companies looking for the best and brightest minds in the audio world. All attendees of the convention, students and professionals alike, are welcome to come visit with representatives from participating companies to find out more about job and internship opportunities in the audio industry. As part of the ever-expanding program of Student & Career Development events at the convention, presentations providing insight from leading names in the industry also help give direction to those beginning or advancing their career in audio engineering. The open-format panel “Careers in the Professional Audio Industry – First Steps,” will be hosted by Richard Weir and cover marketing an individual to potential employers, how to format a CV/cover letter, and how to break into this exciting industry for those just starting out in your career. The AES Milan Student Delegate Assembly will also host the presentation “Classical Music Recording Education Panel Discussion: Contemporary Production Practices and Training Engineers for Today and the Future,” with panelists from the UK, Canada, USA, and France. The panel will discuss ways in which orchestras and opera houses around the world are engaging audiences by experimenting with new and often simultaneous modes of distribution, emerging formats, and new technologies – for example, VR, 3D audio, and "live from…" simulcasts – as well as future obstacles and opportunities to optimize such recordings for maximum impact and preservation in the future. Click here for the latest announcements on Student and Career Development events during the AES Milan Convention. 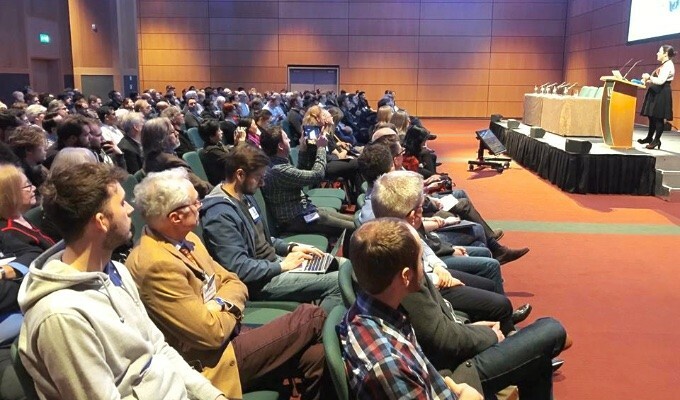 Themed “The Power of Sound,” the 144th International AES Convention will bring together audio professionals, students, enthusiasts and advanced audio technologies from around the world for four days of audio immersion, experiences and networking. Register now at for AES Milan at aeseurope.com for Advance Registration rates through 1 May, including additional discount pricing for AES Member and students. Complimentary Exhibits-Plus badges are also available by using code AES144NOW at checkout.